Project Runway Season 12 designer, Kate Pankoke talks about her experience on the show. BPR: We are pretty much in the dark about the model selection process. Can you enlighten us? KP: That is a really good question... There are some really shady things going on this season... As you know, this season the runway is supposed to be an anonymous runway...so randomly, the producers would say, "You have this model now." Sometimes we got to choose new models, sometimes we didn't, and obviously once you are accustomed to a model and you know her measurements, you really don't want to switch. 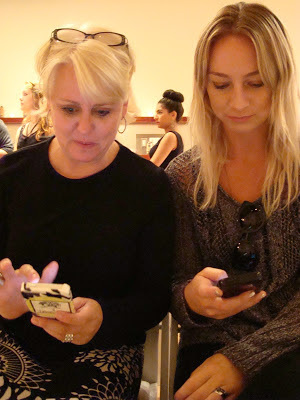 BPR: Was the winner able to choose a new model? I would think that the winner would always choose Ya. KP: Actually, Helen's model, Molly is tied with Ya for wins! BPR: Knowing now that Helen has won so many challenges, do you regret giving her the win in the Coney Island challenge? KP: Not at all... and I don't think of it as me "giving the win" to Helen. I did it because I knew what she was going through. She is such a talented designer, she is a great person, and she worked just as hard as I did. Also, she really needed a pick-me-up from the previous challenge. So, I had two choices. I could recommend her for the win, and give her a boost, or I could nominate myself - giving me two wins in a row and assuring that everyone would hate me. I was happy to recommend Helen for the win. She deserved it. She is amazing. Click here to see Kate's Fashion Week collection. Click here to visit's Kate's website. Jeremy Brandrick's Finale Collection garments are available for your bids. Right now, this garment has the highest price. Click here to see all of the auction items. Kristin Chenoweth and other celebrities partied with Project Runway season 4 designer, Chris March, on September 26th. 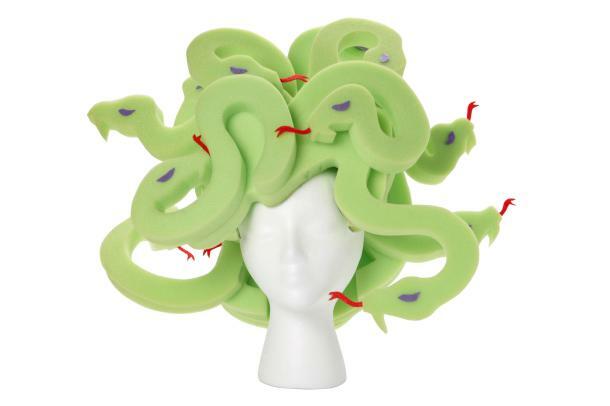 The Halloween party marked the launch of March's fabulous "Big Fun Wig Collection," now available at Target. Click here for the full story from The Wall Street Journal. And Toyouke reports from the Scrap Bin. 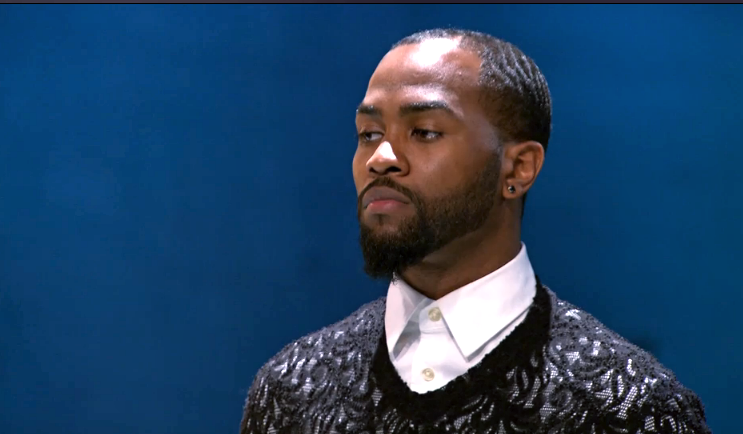 The designers are on pins and needles when they're affected by a previous double elimination. In a fashion test, they must take a risk and spin out an avant-garde look. Actress Emmy Rossum is the guest judge. 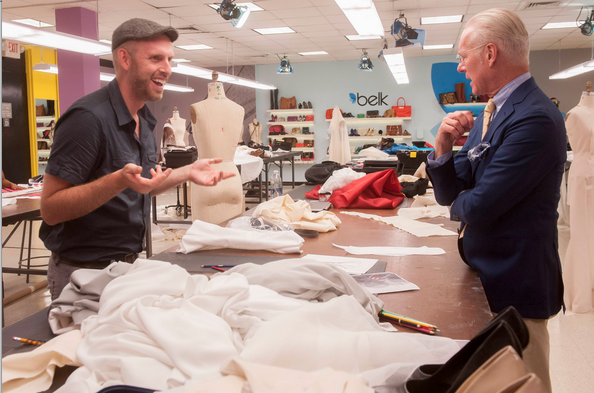 Complete Tim's sentence, "For the first time in Project Runway history..."
OH, HOW WILL IT END????!!!!! Please leave your predictions in the comments - thank you! You've seen the designs on the runway and now it's your turn to be the judges. This week you are Heidi Klum, Nina Garcia, Zac Posen, and Peter Som. Did you see that one coming? With only three episodes remaining before the finale, Project Runway narrowed the field with a surprise elimination. What did you think of the challenge and the results? Post your reactions to Episode 11 here. I have no idea what Heidi and Tim are doing up there with those hand gestures but I suspect we are about to find out as we settle in for another episode of Project Runway. It's getting to be crunch time as we get closer to the finale as the final seven designers fight for one of the spots at Lincoln Center. Team BPR is here again to watch what happens. Join us in the comment section as we snark our way through "Next Generation". 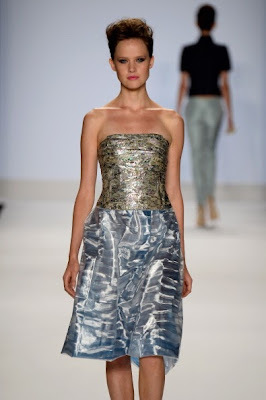 Taiwan and the Smithsonian Museum Present Malan Breton Spring 2014 Collection NYC, NY. 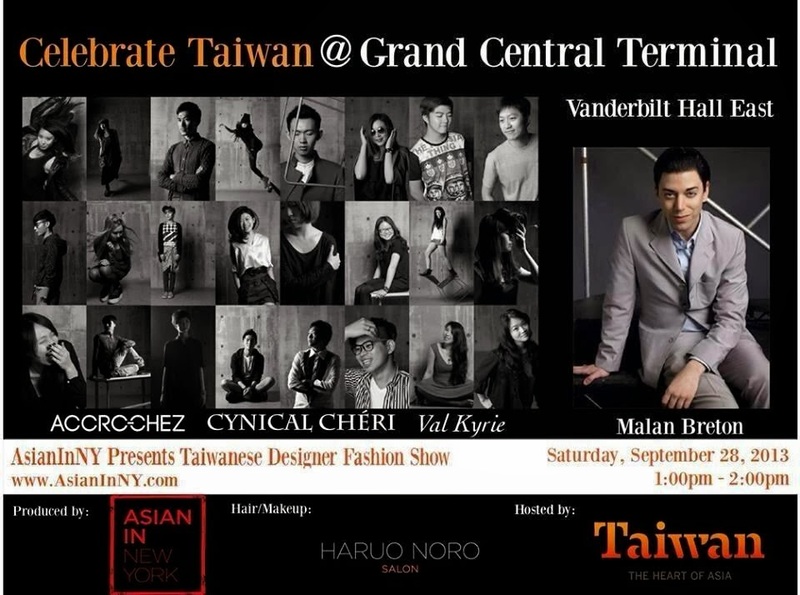 Taiwan Tourism Bureau in New York partners with the Smithsonian Museum promoting Taiwan culture with "Celebrate Taiwan at Grand Central Terminal" this Saturday September 28 from 11 - 2 PM. Taiwan celebrity fashion designer Malan Breton has been invited to show his fashions as a part of the festivities. The Malan Breton Collection will be shown at 1 PM. The Malan Breton collection is inspired by a meeting of delicacy and strength; yin and yang. "The strong Savile Row silhouettes of the 1960's British pops invasion meets the decadent romance of Won Kar Wei's film, In the Mood for Love," explains Malan. The silhouettes are enhanced by opalescent fabrics, old world corsetry, rich brocades, organza, mylar, cashmere, embroideries, and mother of pearl that give these collections a touch of glamour, romance, luxury, and strength. Our polls for Episode 10 are closed. You disagreed with the judges and felt that Justin Leblanc deserved the win. Click here to see the results. You agreed with the judges and felt that Ken should have been the out. Click here to see the results. Tim provided two autographed copies of the paperback version of his book for BPR. Project Runway hosts, Tim Gunn and Heidi Klum just won the Emmy Award for "Outstanding Host for a Reality or Reality-Competition Program." 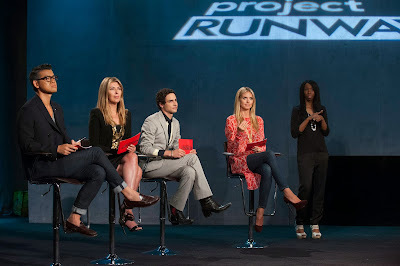 Although Project Runway has been nominated 30 times, the show has only won one additional Emmy Award. What was the award, what was the year, and what was the season? Send your answers (all three must be correct) to Team BPR. Update - we have our winners - thank you! FashionFan22 has several original Project Runway designs available in his etsy shop. These designs were purchased at auction. The dress above is $165.00. Garments from Uli Herzner, Anthony Ryan Auld, Benjamin Mach and Patricia Michaels are for sale. Click here to see all five designs now available. In celebration of Hispanic Heritage Month, Nick Verreos will host an evening with Latina Superstar, Thalia, at Macy's in Herald Square NYC. The first 250 fans will get to meet this superstar singer, actress and author! Plus, with any $25 or more women's purchase during the event, score a copy of Thalia's latest album Habítame Siempre and DVD Habítame Siempre - Edición Especial! Project Runway Season 12 designer, Justin LeBlanc, talks about fashion, deafness and the "Tim Gunn Save." 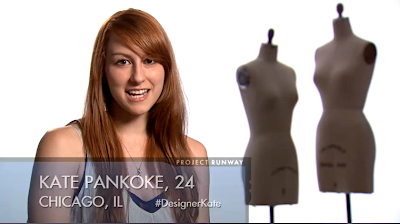 Q: First impressions are key on Project Runway. What was the most important thing you wanted to communicate about yourself, either personally or professionally, through your designs? JL: The biggest thing that I want to communicate through the show is that I don’t perceive my deafness as a burden, but as an opportunity to show people that there are ways to make things work. It’s just a matter of thinking outside of the box and addressing unique situations differently. With regard to my designs, I wanted to convey my love of simplicity, my architectural sense for structure, and my insistence on quality. Click here for the full interview from Policymic.com. 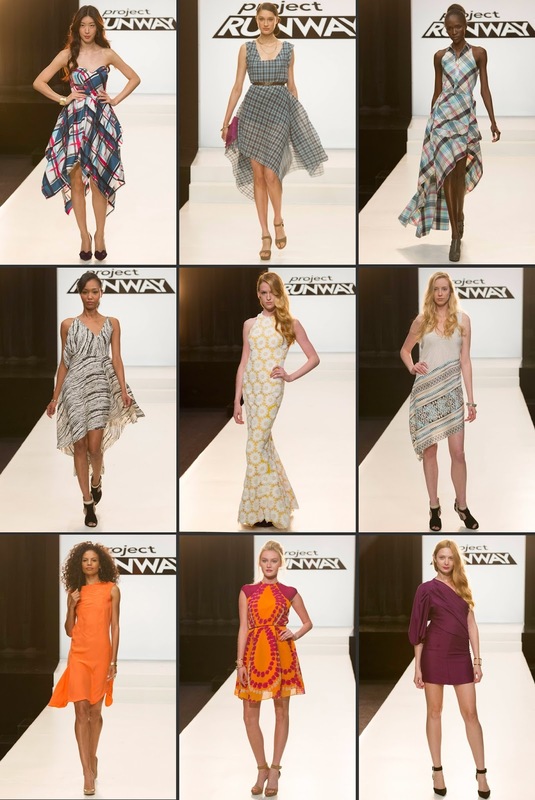 Click here to learn more about tonight's "Fashion Wrap." Heidi wore a Versace gown to the awards presentation tonight. Tim and Heidi presented the award for "Outstanding Choreography" to Derek Hough. And Toyouke knows the score. 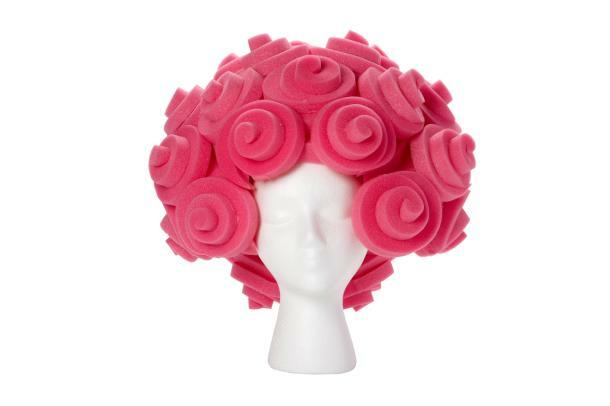 Project Runway Season 12 designer, Miranda Levy, has launched a Kickstarter Campaign to fund her newest 15-piece collection. 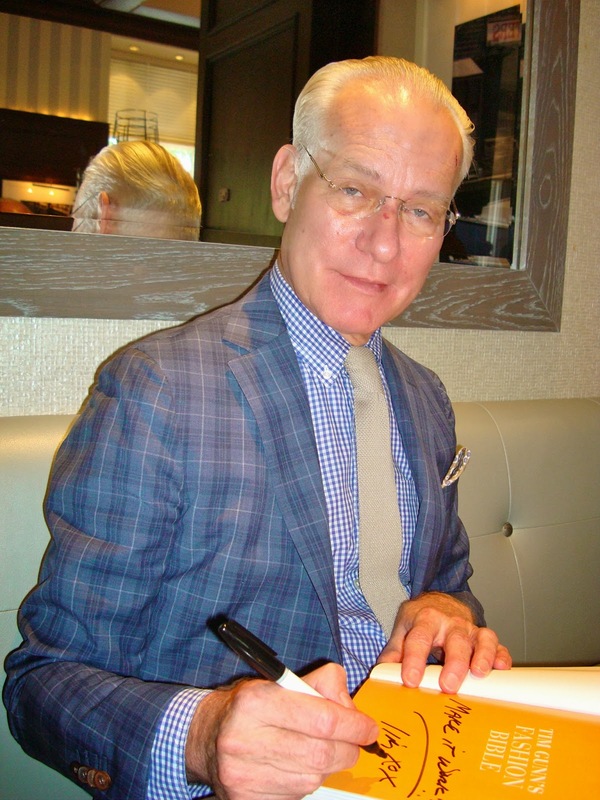 Tim Gunn will be featured as "himself" in episode 4, "The Broken Code" of season 9. 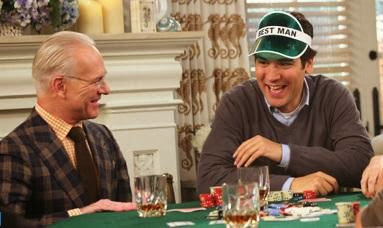 He also appeared in the "Girls vs. Suits" episode in 2010. 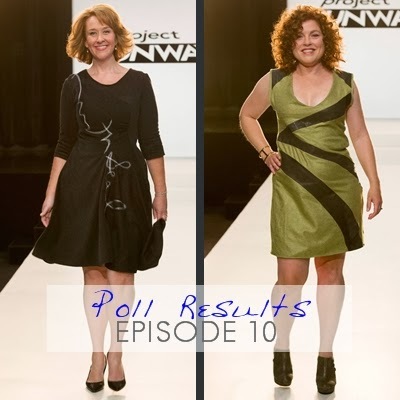 Project Runway Season 12 designer, Karen Batts, talks about her experience on the show. BPR: If you could go back, is there anything that you would do differently? KB: I would be more strategic in how I played the game. I went on the show just designing things that I like and choosing models that I would use. If I could go back, I would have deliberately presented looks that the judges would have liked and I would have chosen a model with more of a runway look. BPR: You know, we are sort of in the dark about the model selection process. You were able to select your models? We never see that. KB: At first, we were given a model and afterward, we did the whole model pick with the button bag. There was a lot of drama when Alexandria stole Ya from Bradon. Then Alexandria won. That was very smart of her. If my name was called before hers, I would have chosen Ya as well. She is a great model. You've seen the designs on the runway and now it's your turn to be the judges. This week you are Heidi Klum, Zac Posen, Zanna Roberts Rassi, and Erin Fetherston. 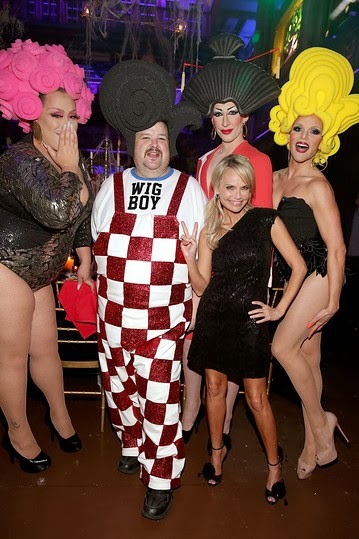 It was a night of fireworks at the Refinery Hotel as some off stage antics tried to eclipse the drama on the runway. What did you think of tonight's episode and the results? Post your reactions to Episode 10 here. Drama lovers should be well fed this evening on Project Runway as designer Ken Laurence has his moment in the sun. But for the rest of us, the focus will be on design and we always get a little worried on these "real women" challenges. We get to meet some fellow Project Runway superfans who will receive makeovers, and these designers better treat them well! The BPR party crew is here and ready to watch it all go down. Simply click on the comment tab to join the party! Our polls for Episode 9 are closed. You agreed with the judges and felt that Dom Streater deserved the win. Click here to see the results. You disagreed with the judges and felt that Ken should have been out. Click here to see the results. Did you agree with the judges last week? The episode 9 auctions are underway. Right now Helen's look has the highest bid. 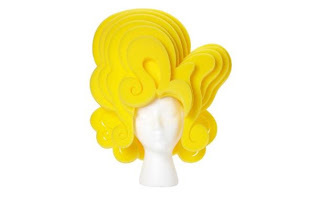 Chris March Halloween Wigs - Now Available at Target! Project Runway Season 4 designer, Chris March, has designed a collection of wigs for Target. Created from foam, the eight designs are lightweight and priced from $15 - $20. Click here to learn more about Chris and the designs. Project Runway Season 5 winner, Leanne Marshall, presented her Spring 2014 Collection on September 7th at the Helen Mills Event Space. Leanne's Collection was lovely, featuring bright hot pink silk with touches of lavender, a black and white toile and of course, bridal whites. 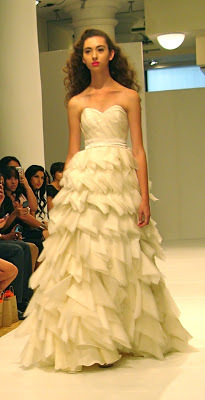 Her signature "petals and waves" were evident in many of the designs, looking fresh and modern. 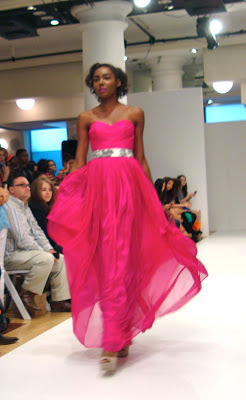 Her models were especially lovely in a bright pink lipstick custom blended by Aveda - a sponsor of the show. 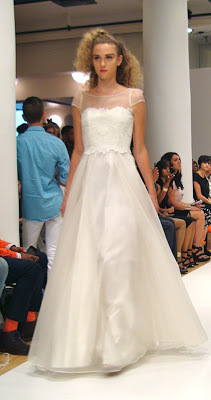 Leanne was inspired by "My Fair Lady" and created a modern ladylike collection as effortless as a spring breeze. Right now, Leanne's collection is created completely by hand in her studio. In the near future she has plans to release a diffusion brand, "LM" which will feature organic fabrics and a lower price point. It was fun to see so many Project Runway alums at the show. Heidi Klum presents her favorites from the Fall 2013 HKNB Collection for New Balance. Click here for a new interview with Heidi from Celebrity Baby Scoop. Heidi Klum and Tim Gunn Win The Emmy Award! UPDATE: Tim and Heidi will also be presenting at Sunday night's show! 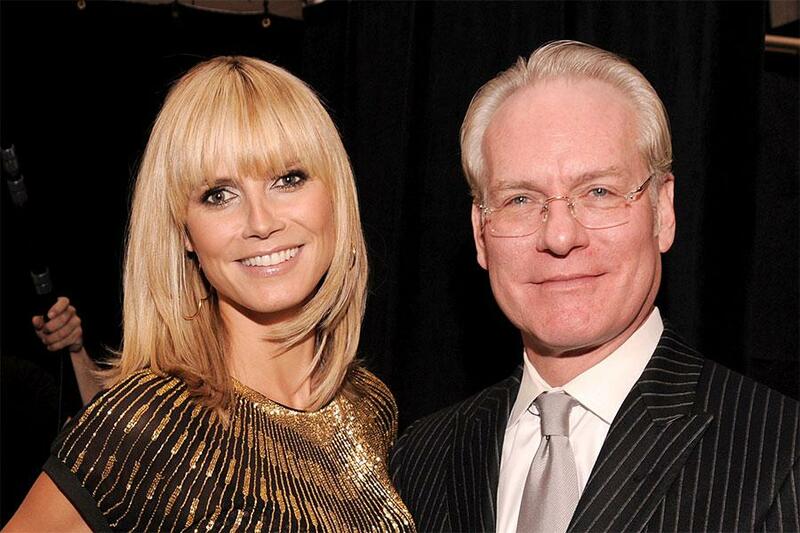 Heidi Klum and Tim Gunn have won the Emmy Award for "Outstanding Host for a Reality or Reality-Competition Program!" Congratulations to the excellent hosts of our favorite show! Click here for a full list of the winners and for more information. The designers are inspired by the show's biggest fans, who receive makeovers and garments crafted specifically for them. 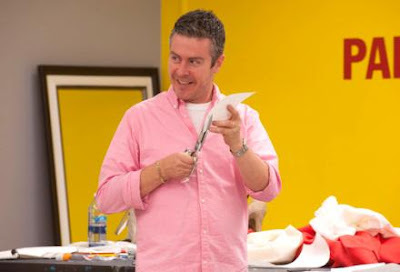 Designer Erin Fetherston is the guest judge. And Toyouke looks forward to next week's drama. Thank you recappers, see you again next week! 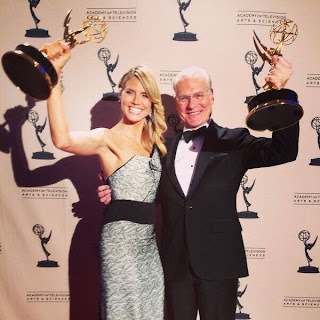 Tim Gunn and Heidi Klum are not only nominated for the "Outstanding Host for a Reality or Competitive Reality Competition Program," Award, but they will also be presenting trophies at tomorrow's "Creative Arts" Emmy Presentation. The Primetime Creative Arts Emmys will be held on Sunday, September 15th at the Nokia Theatre L.A. LIVE in Los Angeles. A two-hour, edited presentation will air Saturday, September 21st at 9:00 PM (ET/PT) on FXX. 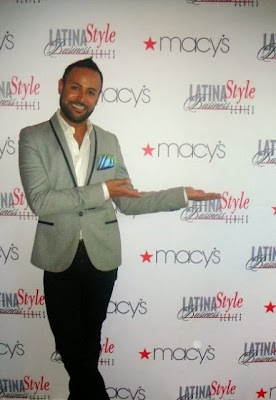 Project Runway Season 12 designer, Jeremy Brandrick, talks about his experience on the show. BPR: Which was your "alternative materials" piece, and what did you use to make it? Click here to see Jeremy's Finale Collection. You've seen the designs on the runway and now it's your turn to be the judges. This week you are Heidi Klum, Nina Garcia, Zac Posen, Stacy Keibler, and John Thomas. 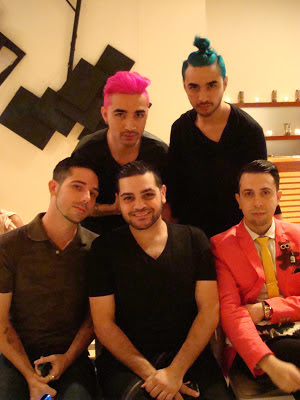 Project Runway All Stars: Season 3!